Georgia are stronger opposition than we faced at the weekend. They are a team that keep the ball very well, playing a 4-3-3 formation. Because they have a reasonable level of technical ability in that central area of the pitch, I'm wondering whether Mick might sacrifice one of his central strikers and introduce a central midfield player as we finished the game at the weekend? Harry Arter came on for Sean Maguire. We finished on Saturday with three in midfield and I just have a feeling Mick might lean towards that. So will Harry Arter start or will Glenn Whelan come in to supplement Conor Hourihane and Jeff Hendrick? That said, I wouldn't have any problem if Mick sticks with 4-4-2. It might be a slightly bolder approach. 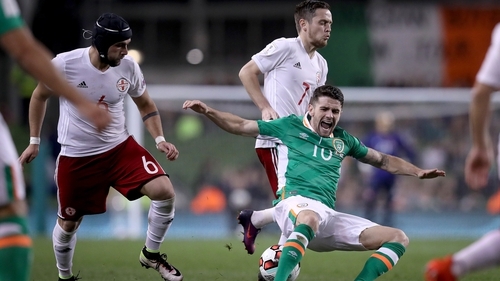 Look, I think he will lean towards three in midfield and potentially Robbie Brady to get a start down the right-hand side at the expense of Matt Doherty. Mick may find a position for Matt at left-back where I think he could be very productive, although Enda (Stevens) was very solid there at the weekend. Georgia are very comfortable on the ball, but they don't scare me. I don't think they have a real cutting edge high up the pitch in their forward players - bit fragile across their defensive lines. I feel if our performance levels are right tonight, start well, and have good energy over the course of the game I think we should have too much for them over the course of 90 minutes. Yes, you should give them the respect they deserve because of previous encounters, but we have to back ourselves, play the quality of football we are capable of and hopefully that will be enough for the three points. Kenny Cunningham was speaking on RTÉ Radio 1's Morning Ireland.